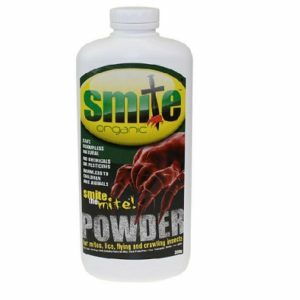 Smite Organic Powder is an organic, naturally-mined, mineral product made up of fossilized remains of diatoms, a type of hard-shelled algae. When crushed to a fine powder it feels similar to chalk powder to the touch, but when viewed under a microscope the fine particles resemble shards of broken glass! It is this ‘broken glass’ effect which is deadly to any insect, but harmless to animals, fish, fowl, food and humans. Use for the control of: Ants, Fleas, Bedbugs, Cockroaches, Stored Product Insects, Mites (including Red Mite), Book Lice, Silverfish, Earwigs etc.